Kevin and I want to thank you and your crew for doing such a fabulous job on our floors. It's hard to believe they are the same floors we started with. You and your crew were quick, neat and did very quality work. We are very happy. Thanks so much! You will be highly recommended. Thank you so much! We love our floors. You did an absolutely perfect job! Mike - The floors look great. Thank you for your hard work. We will recommend you to friends. 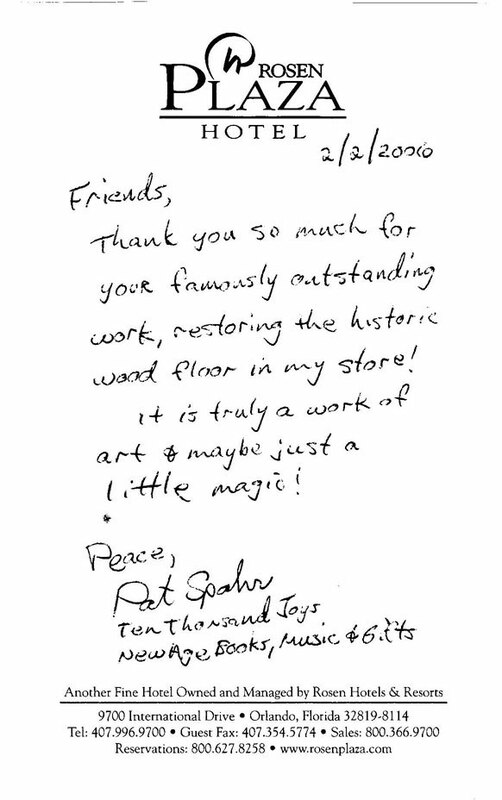 Friends - Thank you so much for your famously outstanding work, restoring the historic wood floor in my store! It is truly a work of art and maybe just a little magic! 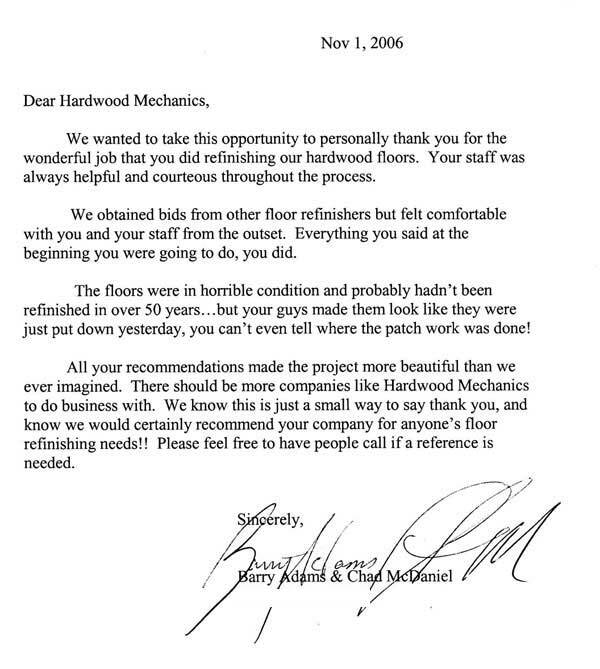 We wanted to take this opportunity to personally thank you for the wonderful job that you did refinishing our hardwood floors. 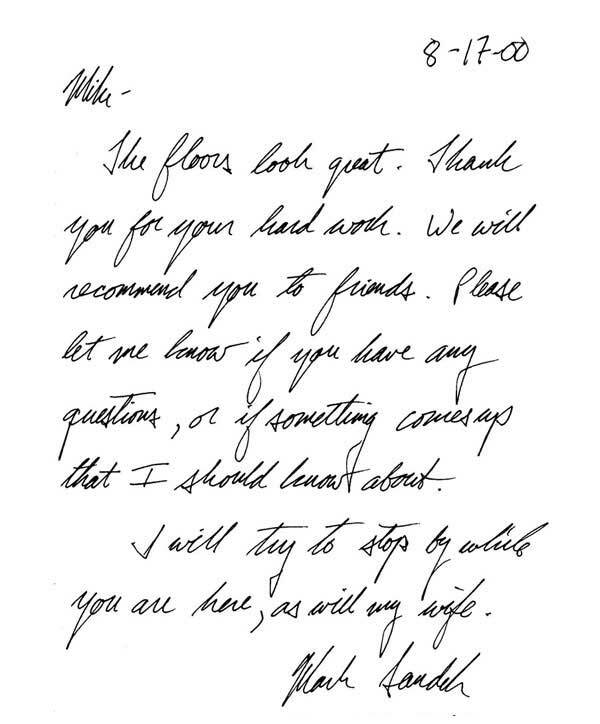 Your staff was always helpful and courteous throughout the process. We obtained bids from other floor refinishers but felt comfortable with you and your staff from the outset. Everything you said at the beginning you were going to do, you did. The floors were in horrible condition and probably hadn't been refinished in over 50 years...but your guys made them look like they were just put down yesterday, you can't even tell where the patch work was done! All your recommendations made the project more beautiful than we ever imagined. There should be more companies like Hardwood Mechanics to do business with. We know this is just a small way to say thank you, and know we would certainly recommend your company to anyone's floor refinishing needs!! Please feel free to have people call if a reference is needed. This is just a quick letter of thanks to your company for the wonderful job done. It's been quite awhile, however, since it was completed. You refinished our hardwood floors while we were on vacation in Maine. Not only were we impressed with this beautiful, quality work that was done, but every aspect of your business. 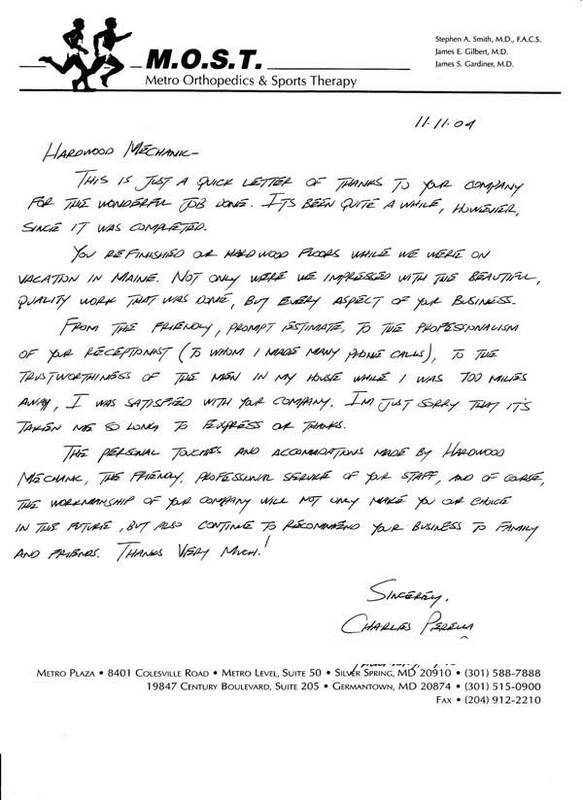 From the friendly, prompt estimate to the professionalism of your receptionist (to whom I made many phone calls), to the trustworthiness of the men in my house while I was 700 miles away, I was satisfied with your company. The personal touches and accommodations made by Hardwood Mechanic, the friendly, professional service of your staff, and of course, the workmanship of your company will not only make you our choice in the future, but also continue to recommend your business to family and friends. Thanks very much! The members of Monocacy Moravian Christian Fellowship (MMCF) wish to thank you for the beautiful restoration of the pine wood floors in our worship room, completed by yourself and the employees of The Hardwood Mechanic. 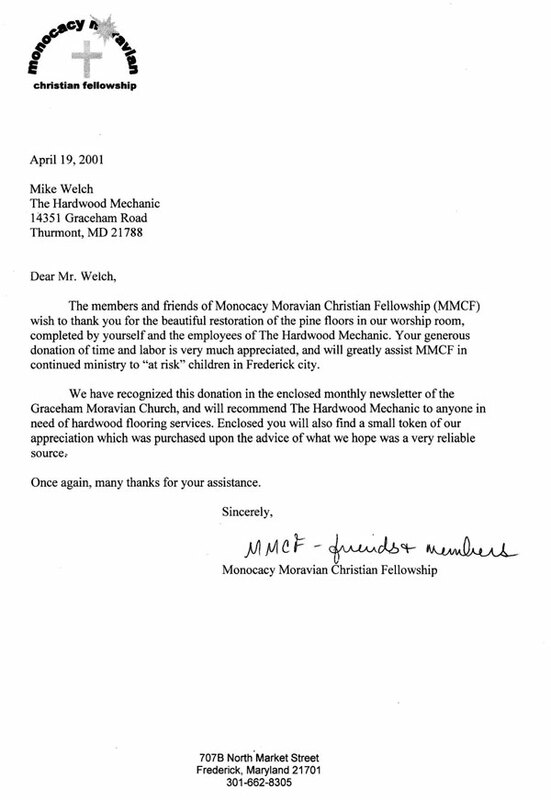 Your generous donation of time and labor is very much appreciated, and will greatly assist MMCF in continued ministry to "at risk" children in Frederick city.